Strategic Intelligence in the Cold War and Beyond looks at the many events, personalities, and controversies in the field of intelligence and espionage since the end of World War II. A crucial but often neglected topic, strategic intelligence took on added significance during the protracted struggle of the Cold War. Supplemented by suggestions for further reading, a glossary of key terms, and a timeline of important events, this is an essential read for all those interested in the modern history of espionage. "A meticulous scholar, Jefferson Adams has written a detailed but fast-paced account of the evolution of strategic intelligence from the end of World War II to the collapse of the Soviet Union and its aftermath. Although the book covers a wide spectrum of issues and deals with a long list of countries, Adams is such a fine writer that he retains the undivided attention of the reader. He is a leader in the field of intelligence studies." 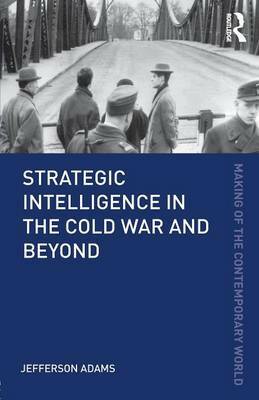 "Strategic Intelligence in the Cold War and Beyond is a valuable contribution to the intelligence literature." "It avoids inundating the student-reader with the trappings of an over-researched monograph and provides the professor's `take' on many Cold War events. . . . The book would make a fine supplemental reading in a course offering in-depth coverage of the Cold War but lacking the linkage to intelligence." "All in all this easily read volume provides a substantive introduction. Even someone well acquainted with the subject is occasionally surprised."